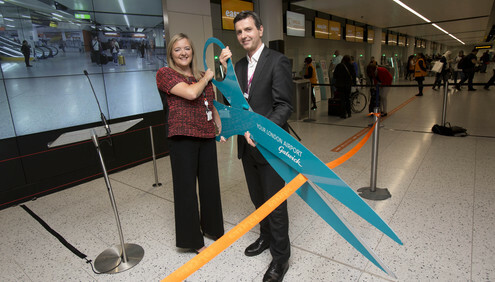 easyJet, Europe’s leading airline, has today opened its new check in area in the North Terminal at London Gatwick Airport which is the world’s largest self-service bag drop. The fully automated bag drop facility for customers will help to reduce and eliminate check in queues. As a result of its introduction queue times have reduced by half and more than 90% of our passengers will wait less than 5 minutes at bag drop. The area, which is over 5,000 square metres, contains 48 self-service bag drop kiosks. Customers arriving into the area are welcomed by easyJet Welcome Hosts who guide them into the auto bag drop area. Customers’ passports are then verified against their boarding pass before they can proceed to the self service kiosks to place their bags onto a weigh scale. A luggage tag is then automatically generated by the kiosks and attached to the bag by the customer. This tag is then verified by laser scanners to check the information is correct and the label attached securely before the bag is dispatched through the airport’s baggage system to the aircraft. This opening enables easyJet to fully consolidate its full operation at Gatwick to the North Terminal in January 2017, creating an easier and improved travel experience for passengers travelling from London Gatwick. “In January 2017 we will move all of our operation into one terminal enabling easyJet and Gatwick to deliver an improved experience for our passengers. easyJet started flying from London Gatwick Airport in 1999 and now has 60 aircraft based there, operating on 106 routes. This year the airline will fly over 18 million passengers to and from Gatwick and has around 1400 cabin crew and 700 pilots operating from the airport.